Few would question the fact that animals – at least all vertebrates – are sentient beings capable of experiencing pain and joy. 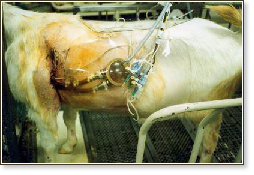 Given this, many people believe that causing pain or distress to animals in laboratories is morally indefensible. Animal researchers usually justify their work by arguing that vivisection benefits human medicine, and since humans are more intelligent than animals, they have a moral obligation to conduct animal experimentation. The fact that animals communicate differently from us is irrelevant with respect to the treatment they deserve. The only relevant issue is whether animals can or cannot experience physical pain and emotional distress. Just as we wouldn't condone cruel treatment of less intelligent or even mentally retarded humans, we must reject harmful experimentation on sentient animals. Do animals inevitably suffer in research laboratories? Scientists often argue that most experiments cause little or no pain. This is misleading. First, many types of experiments are inevitably painful. Toxicological tests, for example, involve the exposure of animals to high doses of test drugs and chemicals. The higher the dose, the more likely it is that the toxic effect will occur. Second, routine procedures such as blood sampling are often very stressful in animals. One standard technique involves drawing blood from the eye vein of rodents, which leads in many cases to blindness. Blood sampling is an inherent part of virtually all pharmacological and toxicological experiments. Even when the dosage used is small and nontoxic, blood sampling virtually guarantees that animals will suffer considerably. Finally, husbandry conditions in laboratories are often poor and standards are designed to meet the economic considerations of the researchers, rather than the welfare of the animals. Caging, in itself, can cause immense suffering. The regulations currently in force in Israel allow animals to be confined in small spaces, and a large proportion of these animals suffer even before the first experimental procedure is performed on them. The bottom line is that animal experimentation without animal suffering is an illusion. In reality, for a variety of economic and practical reasons, animals in laboratories suffer, most of them considerably.